A heavily grained marble floor visually stands up to the spiral staircase in the foyer. Extensive molding frames the entry to the dining room and small hallway to the kitchen and family room. A simple and elegant chandelier of antique brass with crystal beading crowns the space. The living room is a clean, uncluttered rendition of formal. The curves of a green silk paisley sofa are balanced with a clean-lined, wood-framed loveseat and wood chairs with intricately carved backs. An antique brass chandelier with smoky crystal beads and muted green linen shades hangs from a coffered ceiling. The furnishings in the living room center on the fireplace—one of five in the home. This one has a marble surround and extensive molding. It’s topped with a leaded mirror with brass studs. This three-story staircase is the “jewel in the crown” of the home, designer Diane Gote says. It’s the kind of “wow” factor homeowner Dr. Divyang Parikh envisioned for guests’ first entry into the house. The staircase has iron balusters, oak treads and an oak banister. Dr. Divyang Parikh wanted the family room to reflect their Indian heritage and culture. He accomplished that in part with a carved wood swing of the kind seen in Indian palaces. The piece was custom-crafted in India. Custom bookshelves in the family room hold objects the Parikhs acquired in their travels. Damask wall covering in a dark gray with a gold overlay forms the backdrop for the stately dining room. A mahogany table and chairs with graceful carved backs sit on a highly patterned rug in shades of deep charcoal and gold. The windows are set back and framed in gold and almond striped drapes. 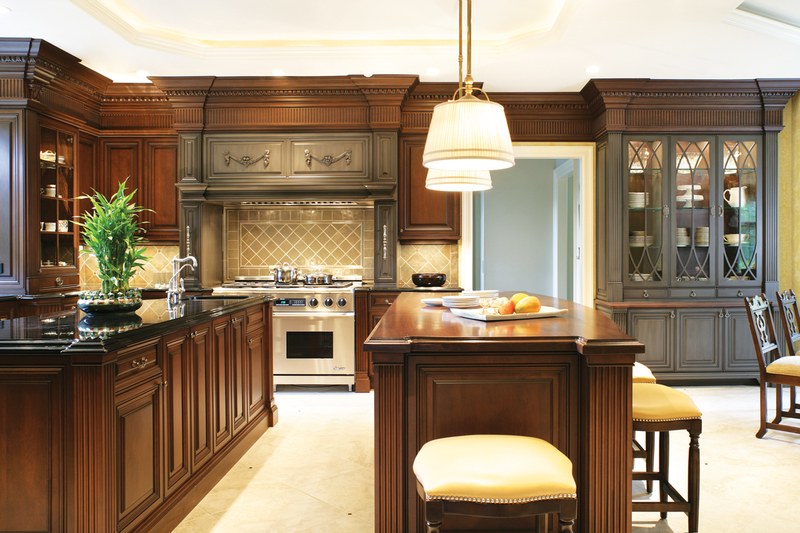 Traditional molding and mahogany cabinetry bring English style to the kitchen. There are two islands; a great way to accommodate two cooks as well as guests who can sit at one of the islands, designer Diane Gote says. One of the islands has a wood countertop while the other is topped in black granite, as are the perimeter countertops. Pewter tiles behind the range add interest. A painted gray pantry has glass fronts to display dishes. The clean, simple fixtures over the island are an example of how the designer “pulled back” to lighten the formal look. A dark wood vanity and the dark frame for the master bathroom tub create drama when paired with a cream marble floor and marble shower walls. The frameless glass shower door affords clear views into the shower, where a marble panel features a knight and his lady. Grayed blue walls form the backdrop for the daughter’s bedroom. The upholstered headboard is a neutral gray, and the built-in shelves and window seat are off-white. In many ways, this new home is a dream come true for the owners. A stunning spiral staircase in the foyer of a new Short Hills, New Jersey home is the “crown jewel” in an interior design scheme that combines classical architectural features, English Regency details and traditional style with a nod to today. That look was “English, really a combination of English and Roman/Classical,” he says. 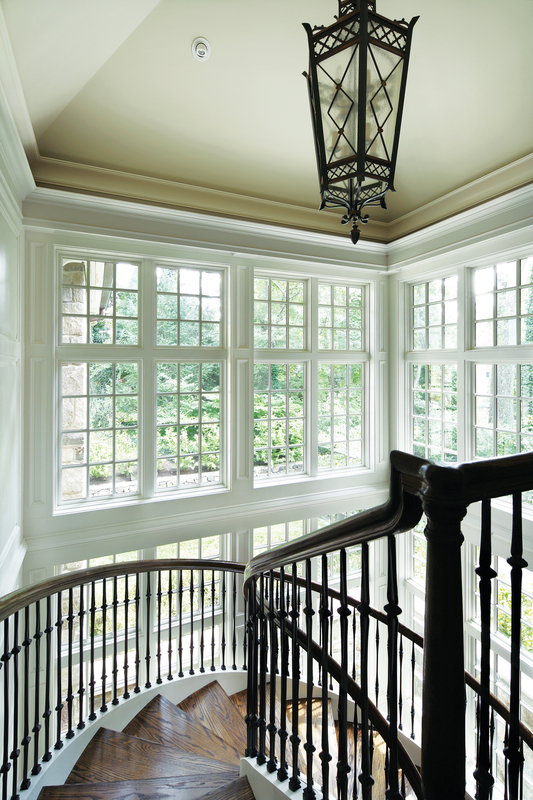 Along with Parikh’s input on the furnishings, the extensive molding and architectural detail stems from his vision. As for the staircase, “I wanted an amazing ‘wow’ factor when you enter the foyer,” Parikh says. The three-story staircase rises from the basement entertainment level to the foyer on the first floor and on to the second floor. It’s surrounded by windows on all three levels. “I wanted the house to be designed so the whole day we would have sunlight coming in through the windows,” he says. A highly grained marble floor in the foyer stands up to the distinctive staircase, Gote says. Columns surround the doorways that lead to the dining room and a small hallway that leads to the family room and the kitchen. 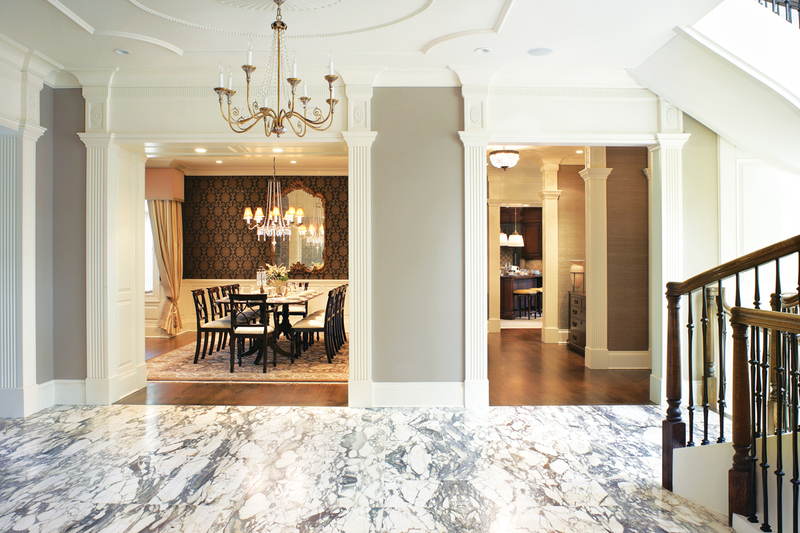 A pattern of curved molding on the ceiling of the foyer extends to the ceiling of the dining room. Crowning the foyer is a custom chandelier of antique brass and crystal beading. It’s graceful, but not overdone, Gote notes. In the dining room, the designer covered the walls with an elegant dark gray damask with a muted gold overlay. 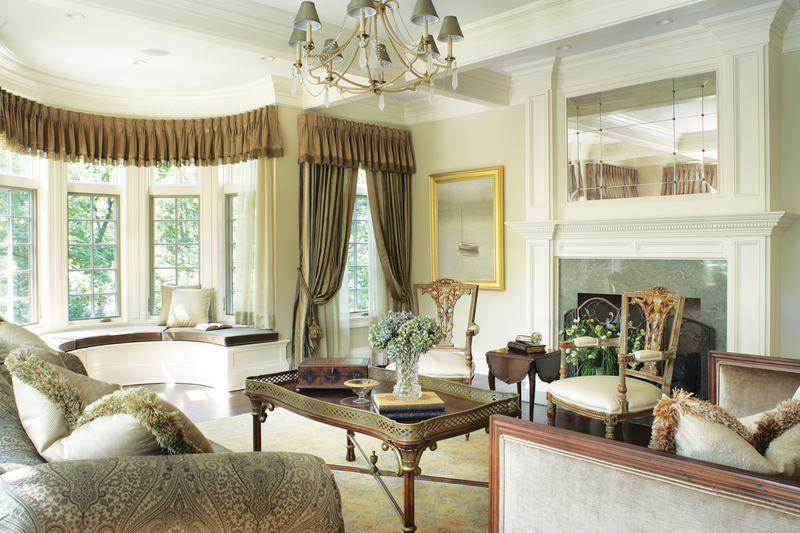 Drapes with a gold and almond stripe frame the windows. A large mahogany dining table and chairs whose backs have a graceful curved outline evoke traditional English style. In contrast to the dining room ceiling’s molding, the living room has a coffered ceiling. It sets the stage for a room with a formal though clean and uncluttered look. The furnishings are centered in a conversation grouping in front of the fireplace—one of five in the home. This one has a marble surround, is framed by classical molding and is topped by a leaded mirror with brass studs. A sofa with a curved back and roll arms is upholstered in a green silk paisley. Contrasting with the curves of the sofa are a loveseat with a wood frame and legs and a high straight back and sides. Chairs with highly carved wood backs are the most formal furnishings in the room, Gote says. French doors topped by transom windows and bay windows surrounding a window seat provide the ample natural light Parikh envisioned—along with views to the greenery outside. The family room also has French doors and numerous windows. But while the rest of the home’s spaces strike traditional English notes, the family room is meant to reflect the Parikhs’ Indian culture, he says. It’s here that the family spends most of its time, he adds. The Parikhs made that statement with an intricately carved solid wood swing of the kind found in Indian palaces, usually on the verandah, Parikh says. He commissioned the custom piece from India and had it shipped to the United States in five pieces. “We use it every day; my wife, especially, likes to sit there and relax,” he says. Completing the more relaxed look of the family room are a comfy deep gold velvet sofa and another sofa with gold and neutral stripes, fronted by muted green/gold footstools. Leather ottomans in front of the fireplace, a round wood cocktail table and a sisal rug add to the comfortable surroundings. Another of Dr. Parikh’s dreams was also realized in the new home. “I thought that when my daughter gets married I want her to come down that staircase,” Parikh says of the staircase he envisioned for his new home. That was exactly what happened when she subsequently got married at home. “In the real sense, our dream came true,” Parikh says. Overall: interior and kitchen design, Design Works in Summit; architect, Mendham Design Architects in Mendham (Dennis Raffensberger and Dan Encin); builder, A. Paragano Group in Mendham. Foyer: floor, Mediterranean Tile in Fairfield; chandelier, Uniquities Lighting in Stockton, woodworking, through Design Works. Living Room: sofa and cocktail table, Century Furniture; loveseat, Edward Ferrell+Lewis Mittman; chairs, Decorative Crafts; chandelier, Hart Associates. 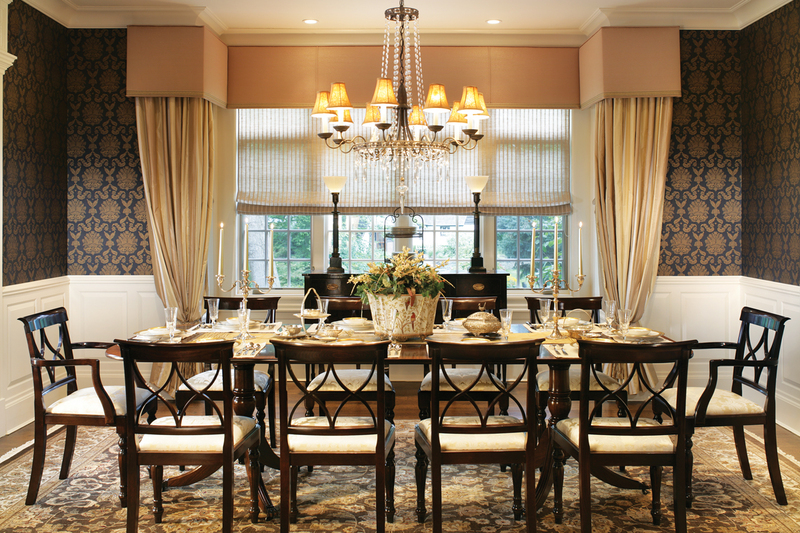 Dining Room: table, chairs and server, Lorna Dewey Furniture Ltd. in Surrey, England; carpet, Lofty & Sons in Secaucus; wallpaper, Thibaut in Newark (T); chandelier, Schonbek Worldwide Lighting. Family Room: sofas, ottomans and cocktail table, Drexel Heritage Furniture; footstools, Pearson. Kitchen: cabinetry, BNC Innovative Woodworking in Brooklyn; flooring, Mediterranean Tile; backsplash, Garden State Tile in Wall Township. Master Bedroom: headboard, Astoria Imports; nightstands, Drexel Heritage; bench, Charles Stewart. Master Bathroom: design, Design Works; cabinetry, BNC Innovative Woodworking; marble, Mediterranean Tile. Daughter’s Bedroom: bed, Stanley Furniture; cabinetry design, Design Works; cabinetry, BNC Innovative Woodworking. T=To the trade.